I am a saver, and I try to capture everything. I’ve got boxes and boxes of old letters and my notes from college. (Have fun at my estate sale, everyone! The treasure you’ve been waiting for!) I bought an extra hard drive to save all of our pictures. I’ve started digitizing all my old home movies. And I like to save TV shows, too. It’s funny for me to think that my kids have always lived when it’s possible to record what’s on TV. I still have tapes from their childhood in a drawer somewhere with old shows on them sitting next to VCR to play them (More treasures!). These days changes in technology have made it so easy to record TV—click a single button on your phone(!) to record a show—that you can imagine why the To Watch list on my DVR is perpetually growing. But there was a time, young friends (and all my old friends here can attest to it), when the only way to see a program was to be sitting in front of your TV when one of the three networks played it the one time they would ever play it. If you missed it, you missed it. And there wasn’t a Wikipedia or an IMDB to go to the next day to read the episode recap. If you wanted to see a show, you scheduled your life around it. So it was in the summer of 1977 when Roots, the mini-series aired. You knew it was an event because everyone I knew—without exception—made certain they were in front of their TV while it was on. Meetings got rescheduled and lessons postponed so we could all watch. It was that big of a deal. The times probably had something to do with it. I was sixteen that year. I was a baby when the Civil Rights marches were happening and only a few years older during the horrors of 1968. Growing up in an all-white town, those events weren’t something that really seemed to affect me that much. We were a patriotic crowd. During the bi-centennial the year before we ate from bi-centennial plates with bi-centennial forks that we bought with our bi-centennial quarters. America was the grandest place on earth! Slavery was a word I had learned in school, but it was a word I knew in order to pass a history test, nothing I had really thought about deeply. Roots was the first time the truths of slavery became real to me—the fetid horror of the slave ships, the ever-present brutality, the rending of families. I was living in the era of women’s liberation when the mantra we girls were cutting our milk teeth on was that we could be anything we wanted to be, and that message was brought into stark contrast by the total lack of control a slave had over her life and her body was stunning. The last several years I’ve been in a race to read as many books as I can in 365 days, but this year I decided was going to be the year of the long books. I wanted to read epics that I had skipped previously because they simply would take too long to read. 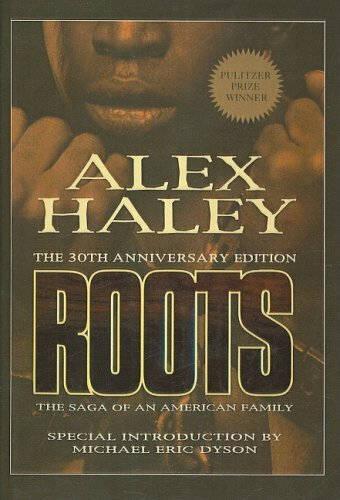 I had purchased Roots from Audible.com much earlier, but now it was time to pull it off the virtual shelf and give it a listen. Simply put, Roots is a great audiobook. Tremendous story by a really terrific narrator. His voices were so right for each of the characters that sometimes I felt like I was listening to a play instead of a book. I still had flashes of the story from nearly 40 years before rolling around my head and I was surprised at how much I did remember—Kunta’s horrific sail across the Atlantic (and Ed Asner’s bad wig), Kizzy’s separation from her family, and of course Chicken George, but reading the book brought new details and insights that I had never known or forgotten, especially the details of Kunta’s life in Africa before he was stolen away. One of the parts I do remember was at the end when Alex Haley went to Africa. I wondered how it would be handled in the book and his whole explanation of how he fit into the story and how he had come to write the story was any genealogist’s dream—true satisfaction with a healthy dose of humility as you realize all those stories—real lives and heartaches—that had come before you. If you want to listen to a good book that will entertain you and make you think all at the same time, download Roots and start listening. You won’t be disappointed.